Omaha IndicatorTM, an advanced Omaha Poker Calculator, offers instant poker odds, real time opponent stats, and betting patterns in easy to understand displays. With this feature-rich poker odds calculator, you'll immediately have every piece of information you need for intelligent and profitable decisions. Omaha Indicator is an officially approved Poker Calculator by PokerStars. Supports Ignition, Bodog anonymous tables, PokerStars ZOOM tables, Full Tilt RUSH games. Works with Limit, NL/PL Omaha Hi and Omaha Hi/Lo games, ring/cash games and tournaments. Supports more than 300 online poker sites. Shows starting hand strength and Hutchison Points. Instantly calculates accurate win odds, pot odds and outs. Easy to use Head-Up Display (HUD). Player Stats helps you better understand your own and your opponents' playing styles. Omaha Indicator categorizes your opponents based on hard evidence (Loose/Tight, Aggressive/Passive, Solid/Overplay), which helps you find the fish, bully the rocks, and exploit the maniacs. You can even run Omaha Indicator while you wait at a table, collecting vital player information - before you even risk a cent! Shows your opponents' mucked cards immediately after showdown so you don't have to retrieve hand history or numerous emails from your poker site. 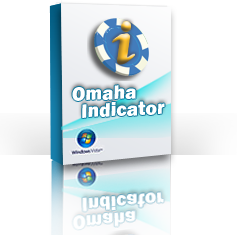 Omaha Indicator has an easy to read interface. It provides full information about your hand and your opponents at a glance. So you can make the correct decision in your Omaha Hi or Hi/Lo game. From the designers of Holdem Indicator, Tournament Indicator, iOmaha Indicator, and Stud Indicator, the most popular Poker Calculator for online poker games.